Before sharing with you my story and experiences, I want to introduce myself. My name is Mariam Khalique and I have been teaching at the Khushal School and College in the Swat Valley in Pakistan for over 11 years. During my time at the school I was Malala Yousafzai’s teacher for many years. Where I come from, most of the people don’t know the value of education. This is the situation even though as you have heard from new UNESCO research that education can save lives. It’s shocking when we stand here and talk about the importance of girls education here today because this is a basic right, which so many still do not have. Ideally, we are not supposed to ask for this right from somewhere else. Education is a basic human right and we are meant to have it already! It is like one breathes, eats and drinks. I fully agree with the UNESCO research, which shows that education transforms lives. It transforms men and women’s lives alike… I have seen it with my own eyes. The fact that education transforms lives and this transformation is seen as unacceptable for many in Pakistan and the rest of the world who want to keep girls’ dependant, enslaved and socially paralysed in one name or other. The people who want to keep the status quo for their vested interest always oppose girls’ education because it moves societies and changes the world and they are afraid of change. In the last few years, the girls of Swat were virtually banned from going to school. Banishing girls education and women’s freedom is the core agenda of Talibanization. The militants have motivated and forced hundreds of parents and girls to quit school. In fact, they destroyed more then 400 schools in Swat, majority of them were girls schools. And their activities were somehow successful as they found culturally and socially a very conducive and favourable environment. They were doing all this in a society where many parents associate modern education with obscenity, vulgarity westernisation. These were the hard days when our students used to see lots of violence on the streets and they were suffering from the worst trauma. Every morning, along with other teachers in my school we had to encourage our girls to continue their studies. I remember when it was announced on the radio that no girl should go to school, we told our students to come to school without school uniforms and bags and hide their books under their shawls and pretend that they are not students. Many schools were closed, but we kept our school open till the deadline which was January 2009 because we were determined to continue the teaching and learning process till the last student and teacher survived. All of these horrible experiences made us realise how important education was. We saw the freedom that education gave. Education made us stronger as girls and women, which is why the Taliban want to ban it. But dear colleagues, boys and girls, this was not a single hurdle, there were many other obstacles in girls’ education. For example, child marriages were and in fact STILL are a big problem in Swat. Girls at the age of 10 years or 12 get married. That’s just a year or two older than you. Like one day, when I was sitting in my office, two beautiful and bright students, aged 12/13, came to my office and asked for a school-leaving certificate because the next month they were going to be married in the very same family. This was not the first time one of my students, who was in year five also got married. Me and Mr Ziauddin Yousafzai (Malala’s Father) have tried to CHANGE this – but we have only managed to reach a few hundred parents so far. Because forced child marriages are a common practice in our society. The transformative power of education. The best protection against marriage is education. I have seen some parents who know what an education can bring and they chose to delay marriages for their children. I have seen girls, as you have seen Malala, demand an education instead of getting married and having children, because they have been empowered by the freedom that comes with being able to read and write. Parents also don’t let their daughters come to school for other cultural reasons. Men are the main earners in our society and women are supposed to stay at home. But we MUST change this. We MUST empower girls and women to stand up for their equality and we can only do this through education. Child marriages also lead to health problems and cause teenage pregnancies which have proved to be very harmful for the health of a mother and her child. Only when a mother is educated can a mother seek the right help for her child, make sure they get the right nutrients and look after herself. How can we expect a 13-year-old girl to be assigned the responsibility to give birth to children and bring them up? It looks very unjust and almost criminal. This is a child giving birth to a child. Again I tell you, an education can change this. I have seen it happen in Pakistan and the UNESCO research shows that it can happen all over the world. But dear colleagues, boys and girls we have gone through great sufferings in my country, we faced militancy BUT Malala’s incident has shaken the ugly and unjust campaign against children and women’s rights. It has knocked at the door of every man’s conscience. 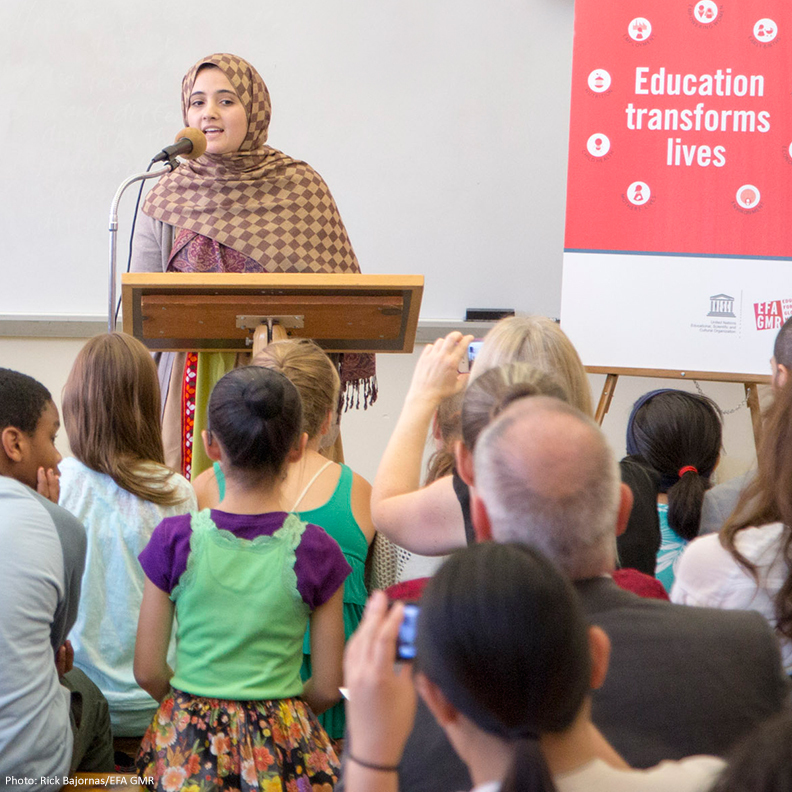 It is the power of education that empowered little Malala to speak at the age of 11. 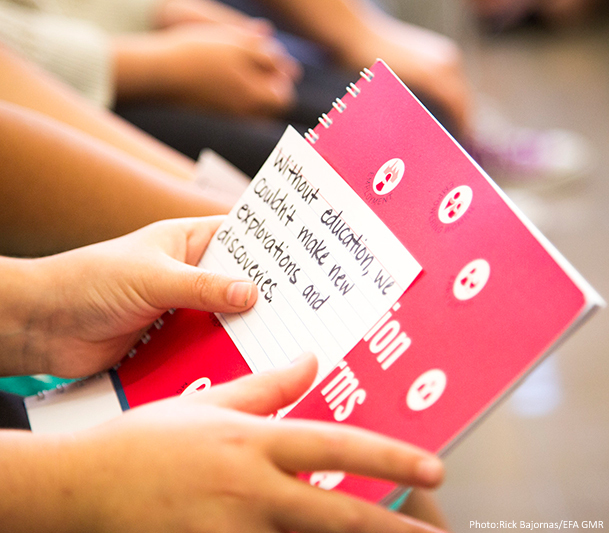 Not only she – we have examples of many other girls who are striving hard to protect their rights. For example, some guests arrived at my office and asked to meet a student of mine who is in 10th grade. When I took them to her. She was amazed and told me that she didn’t know them. I told the guests to leave. The girl signaled to me requesting not to give away her address in case they send a request for marriage. Every hour counts for these children – we must educate girls to help bring about changes quickly in our society. As you can see, education gives girls dignity. You can’t change your life if you don’t know how. If girls and women are empowered they can take control of their own lives and their bodies. That is why education is priceless and important for girls and women not only in Pakistan but all around the world. SO, HERE I MUST CALL UPON all the societies and governments to educate women so that they are empowered and this will help to eradicate women’s rights violations under the pretext of any tradition or custom. If there are no laws, laws should be made. If they exist so, their implementation should be ensured through authorising each and every educational institution to intervene if they notice any such violation. Learning gives us the means to lead meaningful lives and a proper education will also awaken the desire to benefit others. 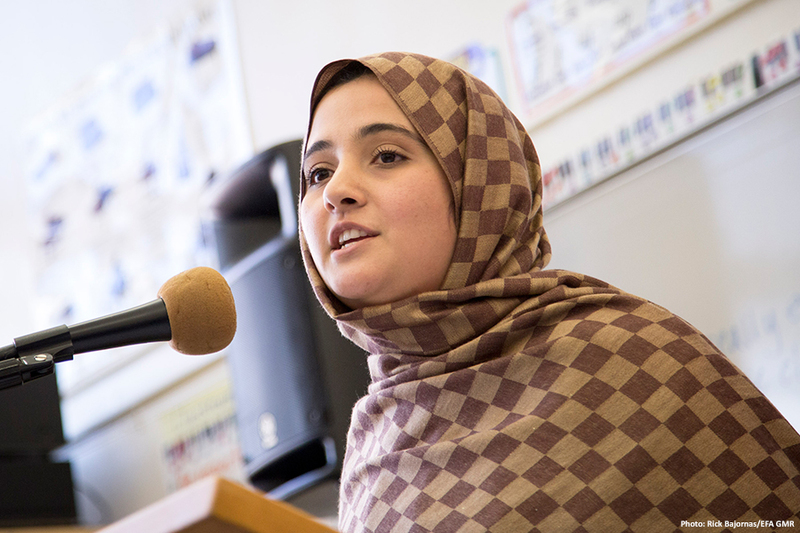 Mariam giving her speech to a class in New York. Now, the situation in Swat, is changing slowly. After experiencing the ban on education, the girls of Swat are more aware of their rights and WANT to get education. To be short the 20th century was the century of massive movements such as that against apartheid and I can see from the way the girls have changed in my class over the years that this century will be the century to fight against women’s discrimination. I’m here talking from the perspective of Pakistan. However, the Global Monitoring Report has run a campaign which over 80 countries have signed up to, calling on world leaders to recognise the role education plays in transforming lives for the better. There is a movement here that governments can no longer ignore. The emancipation of women is NOT possible without education. This entry was posted in Asia, Basic education, Conflict, Developing countries, Equality, Equity, Gender, Literacy, Marginalization, Millennium Development Goals, Out-of-school children, Post-2015 development framework, Poverty, Pre-primary education, Primary school, Quality of education, Uncategorized and tagged equality, Gender, Malala, post-2015. Bookmark the permalink. Reblogged this on Tina Robiolle-Moul. Its really outstanding. i agree that only Education can positive change and provide better life. Reblogged this on tales of a librarian. This is really true that ‘Education can positive change and provide better life. The speech is really valuable and good enough. I agree with Anna that ‘UNESCo might like to document the processes and ‘institutional’ features special to this school’. The key institutional feature being that its private. My guess is that this feature will e conveniently ignored. many thanks, for these comments. Having met Mariam, I can testify that she is indeed inspiring. Any girl having the opportunity to be taught by her will no doubt be inspired by her strength of will to teach even in the most difficult circumstances, as well as the messages she imparts to them. Her recollection of having to tell the girls to hide the schoolbags because otherwise they would be in danger of being attacked on the way to school puts into perspective the real, everyday challenges some children face in getting an education – and the lengths they and their teachers go to in order to ensure it happens. Such dedication of teachers is key to children’s success, regardless of what type of school they are working in. There is an urgent need for the Pakistani government to dedicate far more resources to education than it is currently. Its recent announcement to increase spending from 2% to 4% of GDP is certainly welcome – let’s hope it is implemented to reach the vast number of children,and girls in particular, who are currently being denied an education. In Swat, around 2 out of 3 of the poorest girls never make it to school. The mix of lack of government investment, cultural barriers and poverty, as well as the threats for their security, are a potent mix denying girls the chance to transform their lives. I keep returning to this article because of the line “the best protection against marriage is education.” That one line seems to encapsulate one of the fundamental differences between girls in the United States and girls in Pakistan. In the US, marriage is viewed as a desirable goal, in some cases, the ultimate goal, regardless of a girl’s educational status. Married women in the US are free to pursue further education and in some cases their husbands support and finance them. To be married in the US can enhance a woman’s opportunities for education, while in Pakistan marriage appears to be the end of opportunity for education. I Will Accept “Child marriages also lead to health problems and cause teenage pregnancies which have proved to be very harmful for the health of a mother and her child”. Join the educational learning platform desire2learn school college university cambridge oxford educational organization for online learning. This is a real fact,you are very correct.It should be noted that in whatever you do today without education youare nothing,because even your private buseness or general life activities you need education to achieve dignity. Mariam Khalique and other teachers at Khushal School and College in Pakistan must be diligent in convincing students to attend school despite terrorist threats. They understand how education can save lives, reduce poverty and end violence.